In some Arctic regions, the Russian military is abandoning tanks and armored personnel carriers in favor of reindeer and dogs - the cold-acclimatized animals kept by the natives of the region, the Inuit. The Russian Northern Fleet's 80th Separate Arctic Motorized Rifle Brigade held a drill at a reindeer farm near the settlement of Levozero in Murmansk Region in mid-January. 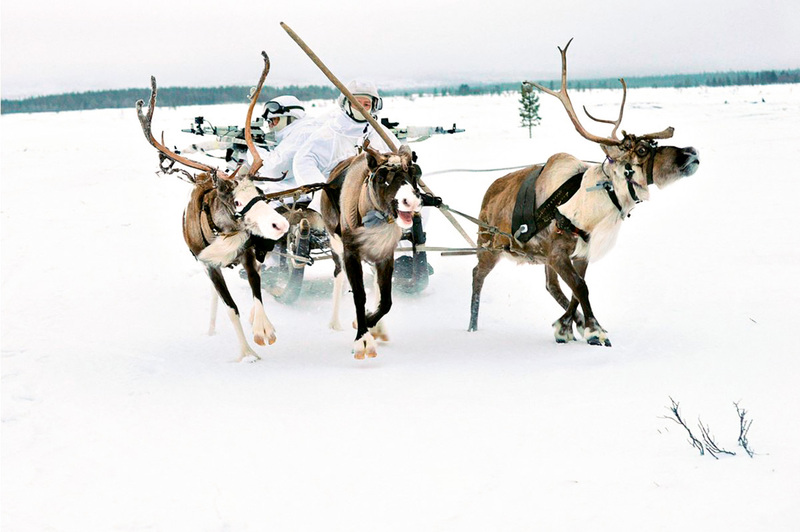 In a region where temperatures can drop as low as minus 50 C (minus 58 Fahrenheit) and giant snowdrifts obstruct the horizon, the Russian military is using a traditional means of transport still used by the northern peoples of the Saami, Nenets, and Komi: Reindeer and husky sleds. Russia's first brigade outfitted to operate north of the Arctic Circle was set up as part of the Northern Fleet in 2015. The brigade is a component of the 80th Separate Motorized Rifle Brigade, stationed in the Murmansk Region settlement of Alakurtti more than 1,150 miles north of Moscow. There are plans to set up a similar brigade in Siberia's Yamalo-Nenets Autonomous District. The brigade uses traditional Inuit reindeer and dog sleds to move its personnel around. During World War II, dog and reindeer sleds were used to evacuate casualties, for transporting cargo and to infiltrate reconnaissance parties behind enemy lines. One of the most successful operations of this kind was the Battle of Petsamo, which involved the storming of a Nazi airfield outside Alakurtti, southwest of Murmansk, in 1942. Dog sleds easily negotiate hills and have no difficulty evacuating casualties and transporting munitions. Husky dogs are known for their strong hunting instinct. In the wild they hunt for field mice, small birds, hares and other game. Dogs begin training for military service while they are still puppies. At the age of four months, the most suitable cubs start to be introduced to older working dogs. With a special counterweight strapped to its back to prevent it developing a humpback, young huskies are allowed to run alongside dog sleighs. Dog packs have a hierarchy of their own. There are two leaders: The most authoritative animal and the one that sets the tempo for the whole pack. Should the driver sustain an injury, the dogs will get him to the nearest populated area. In case of an unforeseen stop along the route the animals are trained to gather around the driver and form a live wall to protect him and keep him warm.